In 1869 a group of Episcopalians in North East was granted permission by Bishop John Kerfoot of the Diocese of Pittsburgh to organize themselves as the Episcopal mission of the Holy Cross. Rev. J. F. Spaulding of St. Paul’s parish in Erie traveled to North East to lead worship, at first in the Lake Shore Seminary (afterward St. Mary’s Seminary, now a branch campus of Mercyhurst University), then in the local Union Hall, ‘neatly fitted up as a chapel’, and in rooms over the bank. G. A. Mueller served as layreader; the Executive Committee were John W. Foll, Lorenzo Curtis and J. H. Haines. 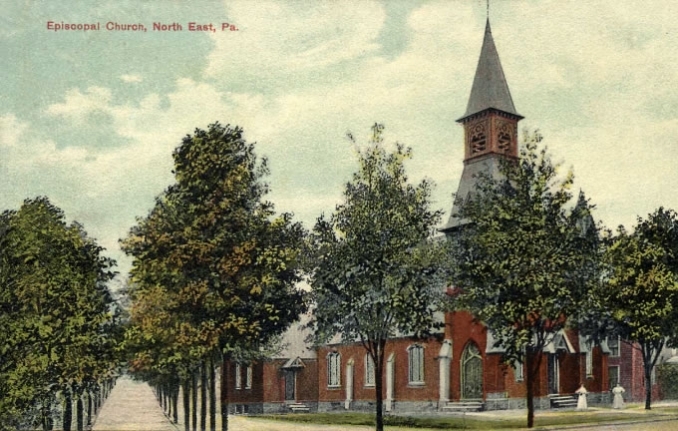 The group held its first confirmation service in 1871 in the Methodist Episcopal Church of North East. Others in the organizing group included Mr. and Mrs. C. U. Johnson, Mr. and Mrs. William A. Grimshaw, Mr. and Mrs. Roscoe A. Davison, Mrs. John W. Foll, Mr. and Mrs. Harry Ellen, Mr. and Mrs. H. F. Curtis, Mrs. and Dr. Ward and Miss Ella May Loomis (who subsequently spent fifty years teaching Sunday School) — many of them were people of wealth and influence in the community. Their aim was to meet their own spiritual needs and those of a substantial population of English immigrants who had come to work in the Grimshaw woolen mill and other new industries. The cornerstone for a permanent church building was laid in 1878, on land acquired from William Allison on the corner of Main and Pearl Streets. It was built of red brick, hauled in by Lorenzo Curtis, and structured on a traditional plan, except for having the altar at the south (rather than the east) end of the building, and windows of painted (rather than stained) glass. In 1880 Bishop Cortlandt Whitehead issued a charter identifying ‘the Episcopal Church of the Holy Cross’ as a parish of the Diocese of Pittsburgh. Vestry members were John W. Foll (senior warden), William A. Grimshaw (junior warden), R. A. Davidson, C. U. Johnson, Henry Ellen, Lorenzo Curtis and William H. Manuel. On September 25th, 1884 (once the building had been paid for), the new church was consecrated. Its outside facade has changed little since then; except that by the 1930s its 50 foot steeple over the bell tower had become unstable and had to be torn down. The remaining flared-roofed belfry has become the church’s unofficial logo. The congregation waxed and waned throughout the twentieth century, and often shared clergy with nearby parishes such as Waterford and Lawrence Park. In the 70s and 80s it was served by clergy from the Society of St. Barnabas. Besides the Brothers, Holy Cross had a series of full- and part-time vicars who lived upstairs in the house beside the church, the downstairs serving as space for parish activities. 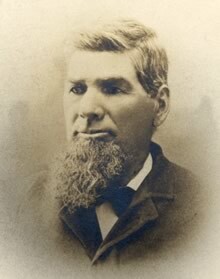 One of the congregational founders who helped construct the church building.